The Shadow Proclamation decrees this to be a class IV protected review and is certified spoiler free. First off the bat, there has been a fair bit of fan muttering about the youth of new leads Matt Smith and Karen Gillan and since the trailers and teasers started to appear, I have heard more than few opine that Who has been turned into Twilight by the new production team. Now before I get what the episode actually delivered and weigh up the merit of this accusation, there are a few important points to be noted. Firstly the casting of Matt Smith would have been decided at the same time if not before as the first Twilight film was being released, certainly well before the screen incarnation of Stephanie Meyer’s books became a bona fide phenomena. Secondly, young Doctors are not a new thing - and no, I’m not talking about that kitsch ‘80s soap from Down Under either. Doctors 1 to 3 – Hartnell, Troughton and Pertwee – were all older chaps and Tom Baker appeared to quite the young whippersnapper in comparison; in fact I recall much proto-fanboy moaning in the playground that he was too young for the role. And the same ‘too young’ argument kicked off again big style with 5th Doctor Peter Davison but we all got used to it and indeed, bar the blip of the older Sylvester McCoy, the world’s favourite Time Lord has been considerably more youthful than the initial trio of incarnation. And come to think of it, the ‘too young’ thing reared its head again when David Tenant was cast… and we all know how well that turned out. Finally though and most conclusively, Doctor Who had already done the romance between an immortal and a human girl thing back when Edward was still Cedric Diggory. And although it’s a little early in the season to speculate on the twists and turns of the new Doctor’s relationship with Amy, I really can’t see Steven Moffat rerunning the Rose/10th Doctor romance. The defence rests m’lud! Now onto the episode itself! Well, I am quite stunned - that was a truly frenetic hour and five minutes! Don’t fret the TARDIS is in safe hands and the new boys are going to turn out just fine. Of course what you really want to know is how is the new Doctor? Well, as I expected this episode doesn’t gives us an entirely clear picture of what the new Doctor will be like. Whenever a Doctor regenerates there is always the now traditional period of flapping confusion until his new character stabilises and The Eleventh Hour is no different. However with the extended running time of this episode he actually gets plenty of time to get to grips with his new self. Now rather than the usual excuse for acting strange and mugging comically, in this bout of post-regeneration trauma you get a clearer sense of the new character emerging. And what he like? Barking, mate. I think we could well be in for the most alien doctor since Tom Baker - he has that same balance for shifting between appearing mad as a brush and the sanest man alive at the same time. But the real acid test for any new actor in the role is how long does it take them to convince that the are not the new Doctor but they ARE the Doctor. And personally speaking, Matt Smith had me by the halfway point. We don’t get to learn very much about Amy Pond due to the frantic storyline but I suspect we’ve been introduced to key players in her life throughout the episode that will more significant later in the series. But despite the lack of biography, we do get a strong measure of what kind of girls going to be and it’s safe to say she’s no drippy Bella - “feisty” is the word that going to be on everybody’s’ lips. Yes it’s a cliché but in this case it is bang on for once. And performance-wise Karen Gillan displays a great chemistry with Smith. Sparks are going to fly, mark my words! Now story-wise, essentially what we have here is almost a brand new pilot, but we tend to get these very time there a new companion, never mind a new Doctor. And as such the story line is less about the threat of the week to be foiled than throwing the new characters together. 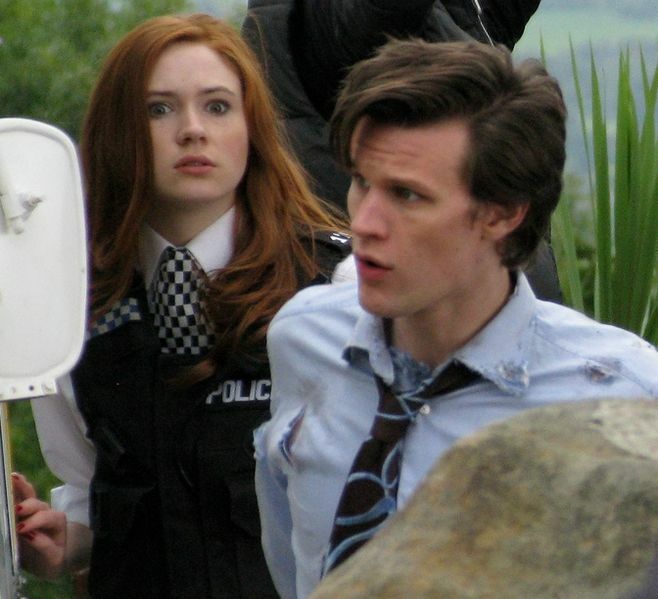 However, I’d say The Eleventh Hour is best the bunch. Streets ahead of Tennant’s debut which he slept through most of, and showcasing the Doctor better even than Rose. The plot itself is fairly typical menace to the entire planet that RTD was so fond of. And I suspect that’s deliberate - Moffat’s bringing in the new but reassuring us with the sort of story we all know the shape of. For example, The Atraxi are right out of Big Russell’s Big Book Of Retro-pulp Sci-Fi but Prisoner Zero is pure Moffat and I can already hear a media studies thesis being written exploring the aliens in this story are culturally symbolic of the aesthetic ethos of the old and new production regimes. Now I wouldn’t be going that far this early into the new run you’ll all be relieved to hear. But I do think that my prediction of this story functioning as a bridge to the previous era holds up. Moffat delivered exactly what people expect of Doctor Who but is doing it in a somewhat different way - the show seems a lot more energised and yes, it did seem to have a slightly darker feel to it. Really though it’s too early to tell how the season is going turn out stylistically. As this is a fresh start for the Doctor, I’m wary speculating on the rest of the series based on what is effectively a pilot, because as every fanboy knows pilot episodes are living proof that children don’t always resemble their parents. What I can say though is that no matter whether the show’s approach changes significantly or not, the quality level will be remain as high as we are used to. And if the remaining episodes simply continue with the same sort of fare as the RTD days I suspect this team will be serving it with a higher level of elan. But shifts in the tonal direction of the show aside there are all of cosmetic changes. The first swish of the new broom comes with an all new title sequence which is really liked. However there is also a new theme tune which frankly just didn’t impress me. It’s a lot more electronic which is good but they seem to have blunted the tune somewhere in the ambient noises. It might grow on me but I think it’s going to be unpopular. Personally I think they should just admit defeat and go back to the Delia Derbyshire renditions of score. Beef up the production a little maybe, but basically you are never going to get another arrangement that will ever come close to those original radiophonic arrangements. Even today they still sound like they are beaming in from the future. Now we don’t get to see all the new kit until the close of the episode but you get to see it all onscreen long enough for a good look. The new TARDIS is a definite improvement in this old Who head’s book. Don’t get me wrong I liked the revamped version sporting the coral desktop theme introduced for the RTD era, but this version is has it all. While clearly retaining much of the aesthetic stylings of the former console room, the new design also incorporates a lot more of the classic series TARDIS in its decor. The roundels that bedeck the walls are closer to the original design and the huge concentric silver rings and attendant gubbins are right out of the very first console room design back in the William Hartnell days (have a gander here and see for yourselves!). And while still on the hardware, I was particularly taken with the new look sonic screwdriver. We only get a glimpse in this episode but having just a good look at some stills, again like the TARDIS refit, it’s pleasingly closer to the classic series version. Although in the case of the Doctor’s famous multi-purpose tool I’ve never really seen what was so wrong with the original design. But that said, I do like that the new sonic screwdriver looks more like a proper tool than a space age magic wand. And I can only hope the scripts follow suite. The Doctor’s new togs work pretty well too - there’s aren’t many men who can wear a bow tie and not look a plonker but thankfully Matt Smith is one of their hallowed ranks. Although have raised eyebrows over the new garb, I personally quite like the Time Team chic his outfit has. Plus the tweedy absent minded professor helps to remind us that although he may look young, the good Doctor is just well over nine hundred years old. So in conclusion, the Doctor is back and his future is in safe hands. If the show keeps up this level of energy then we are in for the best season yet. Now in all honest, I start every season with that hope when you see a preview, however it’s the first I’m still entertaining such high hopes after the close of the first episode.